The Raptor is a vehicle utilized by the Colonial military. A versatile craft, it is designed to perform multiple roles, but the Raptor most commonly takes part in reconnaissance and scouting operations. 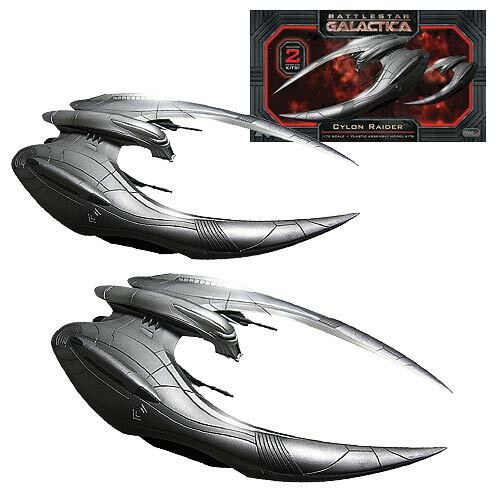 There have been at least two variants of this design in use by the Colonials since the outbrake of hostilities with the Cylons. ​Special Price £35.95 Saving £14.00!! Scale 1:4105th. All New Tooling of the Original 1970,s TV Series Battlestar Galactica. Decals Include All the Different Battlestars in the Fleet. ACROPOLIS-ATLANTIA-COLUMBIA-GALACTICA-PACIFICA-PEGASUS-RYCON & TRITON. Product Code: MMK942. Requires Construction & Painting. See SF&F Issue No 32 for Kit Review! 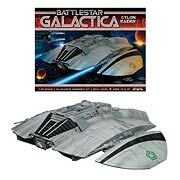 1/32nd Scale of the original TV Series Battlestar Galactica 1970,s.17" Wingspan in scale with Mk1 Viper. Requires Construction & Painting. See SF&F Issue No 32 for Kit Review! 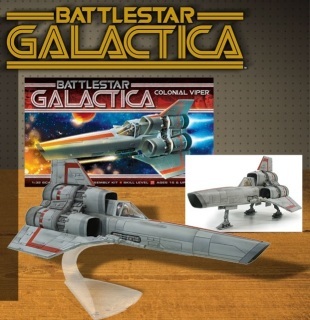 Colonial Viper Mk1 from the original Battlestar Galactica 1970,s TV Series. 1/32nd Scale - 14" Long. Comer with Landing Gear & Pilot. Requires Construction & Painting.Comes with Bonus 35th Anniversary Poster. 6.5" long. esin. 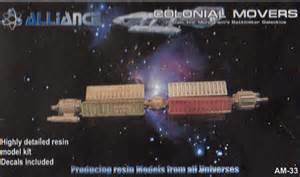 Model of the Colonial Movers ship in scale with the Monogram Battlestar Galactica kit. Contains eighteen pieces plus decals. 1:9600th scale. Resin. 4" long. Seen in Razor Feature on New Galactica Series. 4" long - 4 resin parts + base. 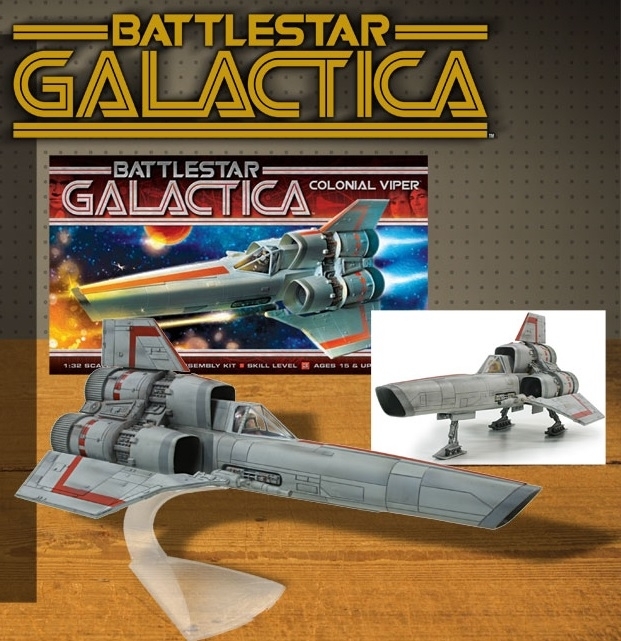 The Colonial Viper MKII, our first Battlestar Galactica kit release. Now you can take your Moebius Batthestar Galactica Model Kit to the next level with this fantastic upgrade kit. 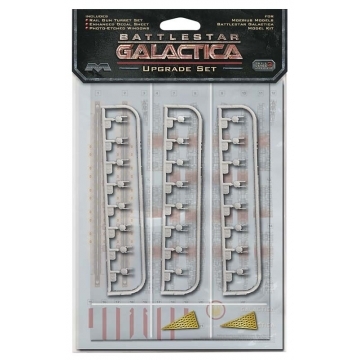 Enhanced Deca Battlestar Galactica Upgrade in 1/4105 scale from the plastic Sci-Fi model range provides a set of additional Photo Etched Museum Windows & Detailed Gun Batteries parts and decals for upgrading the 1/4105 scale Battlestar Galactica model kits. 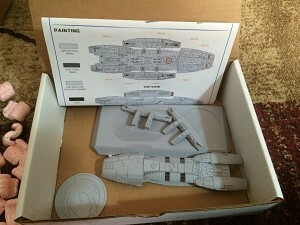 This plastic spacecraft upgrade kit requires paint, glue and the 1/4105 scale Moebius Battlestar Galactica kit . 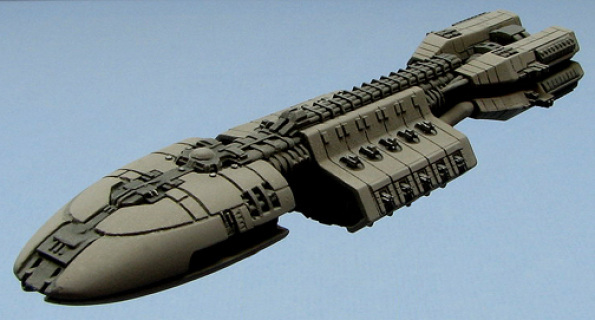 1,4105th Scale - 18" long Plastic of the Battlestar Pegasus from the 2003 TV Show. More room to display! 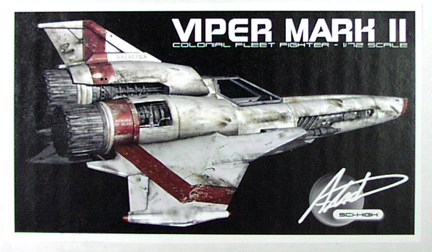 1/72 MKII Viper is just a resized version of our original 912 MKII Viper. 2 per pack, complete with stands. 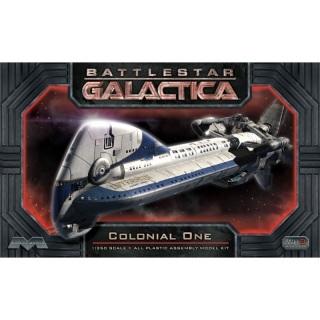 In the original run of Battlestar Galactica, the Colonial Viper is the only known fighter flown by Colonial Pilots, referred to as "Colonial Warriors". 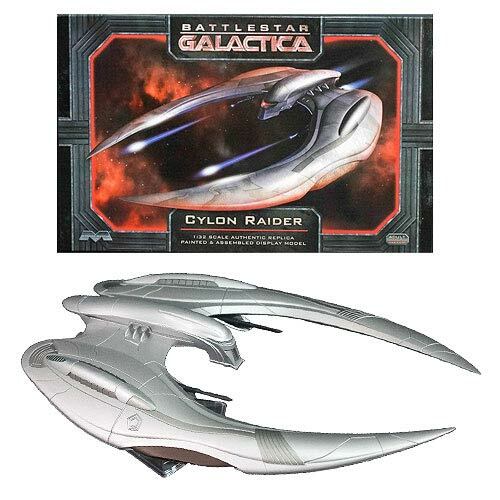 There is only one known model of Viper seen in the series. 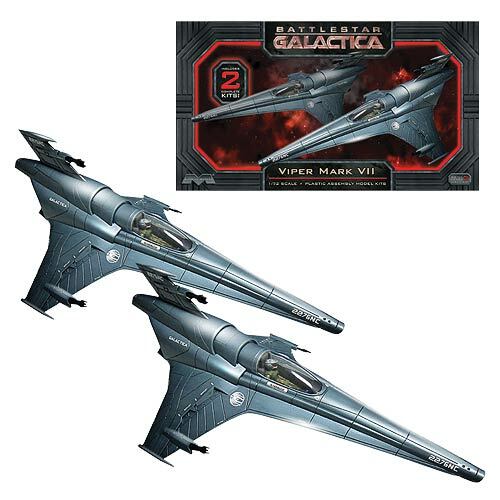 Some materials list the Viper as a "Starhound Viper" or "Starhound Class" fighter, based on information in the novelization of "Saga of a Star World". The Vipers are launched from a long tube in one of a Battlestar's landing bays, assisted by a powered catapult mechanism. 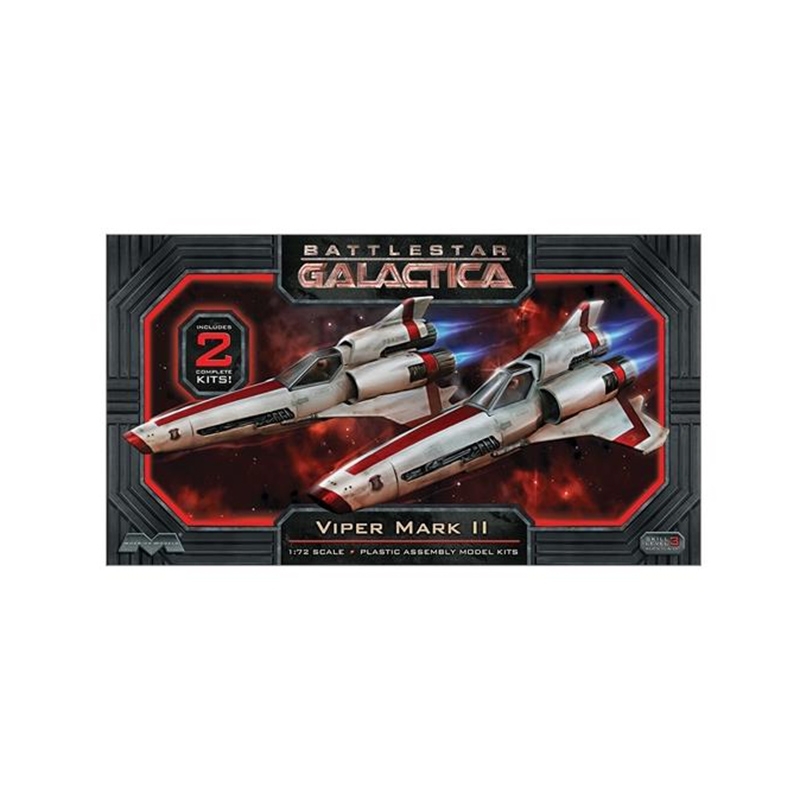 It appears that a Battlestar can launch at least three Vipers from each bay at once. Vipers are loaded into the launch tubes atop rails which engage recesses in the bottom of the fuselage between the lower wings. The rail system ensures that the Viper remains on the centerline of the launch tube. Vipers typically use all three of their engines for powered flight, and can use a "Turbo" boost for greater speed, analogous to a modern fighter plane's afterburner. A pilot can turn on or off each engine by a push button, as seen in the startup sequence anytime a Viper is preparing to take off. Vipers can also reverse thrust for rapid deceleration, a useful tactic when being pursued by enemy ships that would then tend to overshoot the Viper, placing them in a vulnerable position. Vipers are capable of atmospheric as well as space flight, and can land and take off from a planetary surface. Viper engines are designed to collect commonly occurring gases in planetary atmospheres and in space to power the ship's fusion reactor. Vipers are also capable of supporting the pilot for up to two weeks in a form of "suspended animation" for extremely long missions. More room to display! 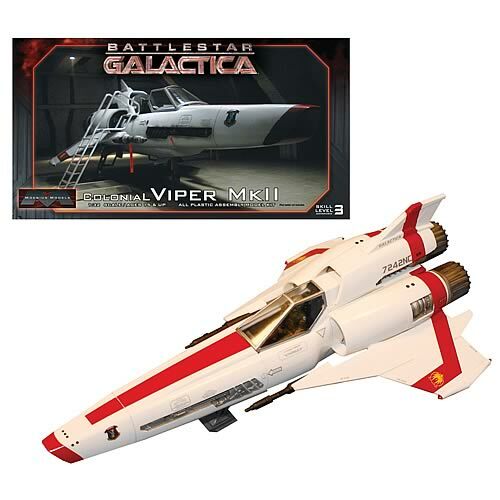 1/72 MKVII Viper is just a resized version of our original 916 MKVII Viper. 2 per pack, complete with stands. SPECIAL OFFER £23.95 Saving £21.00!! 1:9600th scale. Resin. 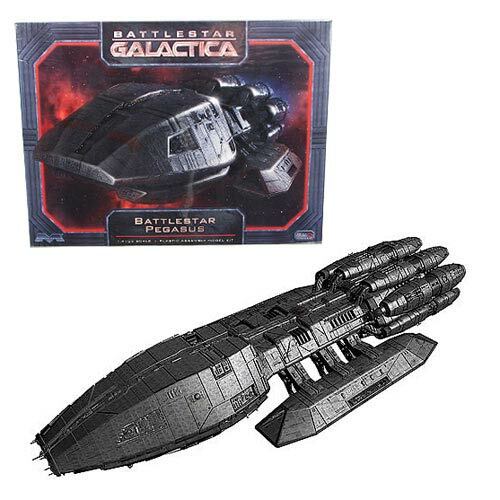 New Battlestar Galactica Colonial warship in scale with Alliance Models Galactica kit (AML0041). Four resin pieces with base and deacls and measures 4" long when complete. 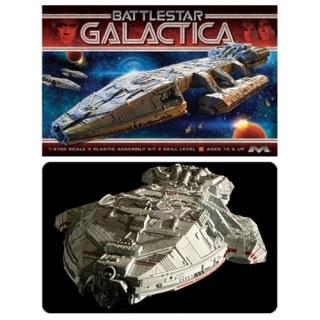 Alliance New Series Battlestar Galactica. 1/9600th scale. Resin. Complete with stand and Decals. 1:72nd scale. Resin. 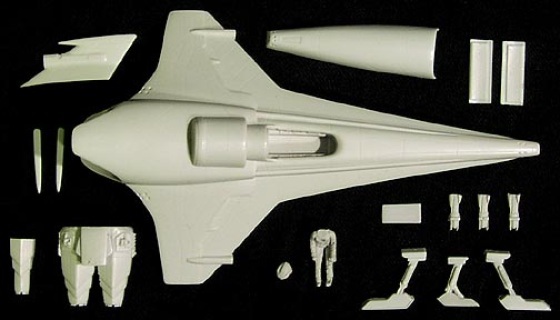 Model of the Mark II Viper from the new Battlestar Galactica tv series. Nearly 5" long with 28 resin pieces and clear canopy. Includes pilot,landing gear,decals by JT Graphics and thorough instructions with colour views. 1:72nd scale. Resin. 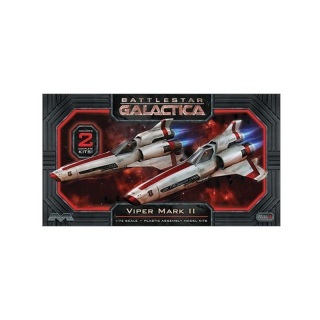 Model of the Mark VII Colonial Viper from the New Battlestar Galactica comprising of 18 resin parts with a clear canopy ,pilot figure and decals. Measures 5.5" long.